Arsenal captain Per Mertesacker has announced he will retire at the end of the 2017-18 season to take charge of the club's academy. The defender, signed from Werder Bremen in August 2011, played only twice last season because of injuries. Arsenal have announced that he will start working with the academy this season to prepare for his next role. "Per is an exceptional character who is a great example for young players," manager Arsene Wenger said. "He is a deep thinker about the game and committed to helping players fulfil their potential." 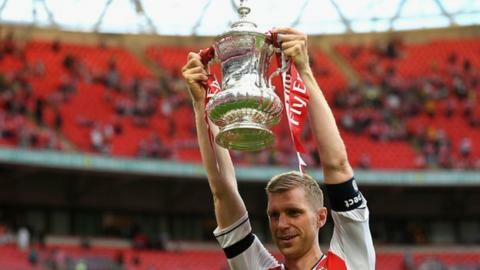 Mertesacker returned from injury to lead Arsenal as they beat Chelsea at Wembley in May to win the FA Cup. The 32-year-old has made more than 200 appearances for Wenger.